This is an updated Ideas for Easter Dinner. 1. DISSOLVE YEAST IN MILK IN A LARGE BOWL. STIR IN 1 CUP OF THE FLOUR AND 1/2 CUP OF THE SUGAR, COVER BOWL WITH PLASTIC WRAP, AND SET ASIDE FOR 1 HOUR. 2. STIR 1/2 CUP WATER AND BUTTER AND 5 OF THE EGGS AND MIX THOROUGHLY. SIFT 8 CUPS OF THE FLOUR, SALT AND REMAINING 1 CUP SUGAR INTO MIXTURE. ADD ORANGE AND LEMON ZEST, AND MIX THOROUGHLY WITH A WOODEN SPOON. TURN OUT DOUGH ONTO A FLOURED SURFACE. KNEAD (ADDING MORE FLOUR IF NECESSARY) UNTIL SMOOTH, ABOUT 10 MINUTES, THEN FORM INTO A BALL AND PLACE IN A LIGHTLY GREASED BOWL. COVER WITH A CLEAN DISH TOWEL AND SET ASIDE TO RISE FOR 2 HOURS. 3. RETURN DOUGH TO FLOURED SURFACE. DIVIDE INTO 6 PARTS, ROLLING INTO ROPES ABOUT 15″ LONG. FOR EACH LOAF, TIGHTLY BRAID 3 ROPES, THEN PRESS 1 DYED EGG (IF USING) NEAR THE END OF EACH BRAID. SET BREAD ASIDE TO RISE AGAIN FOR 1 HOUR ON A LIGHTLY GREASED COOKIE SHEET. 4. PREHEAT OVEN TO 350˚. BRUSH BREAD WITH BEATEN EGG, AND BAKE UNTIL GOLDEN, 40–50 MINUTES. This is will be an unusual Easter Brunch. It’s going to depend a lot on whether Michigan State Spartans win in the Sweet 16 tournament on Friday. Go State! If they do then they will be playing again on Sunday. My husband is going and he is the one that wants the big dinner. I want to make it special but it’s pretty up in the air at this point. I need to have an easy meal only because I’m not sure who is going to be here and my 3 year old grandson only cares about the Easter basket and the candy and having fun. Here is the plan but it might be wishful thinking. 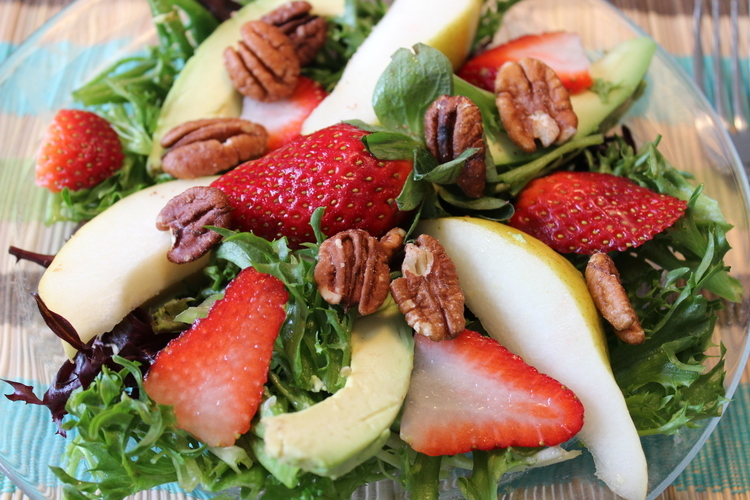 Many of these recipes have come from websites with delicious foods. I’ve tried to site them when available. Enjoy and let me know what you think! 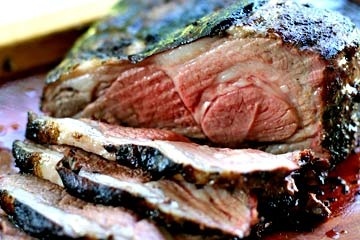 I’m definitely going to marinade and grill a butterflied leg of lamb. 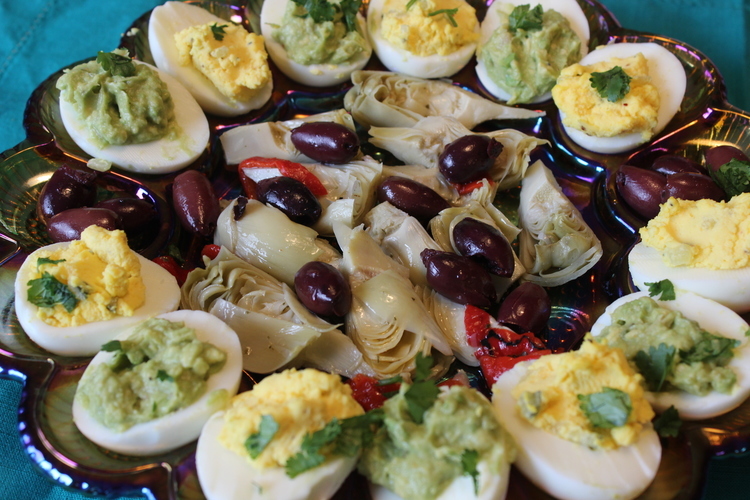 Have a great fruit salad, and Prosciutto wrapped Asparagus and Guacamole Stuffed Deviled Eggs. 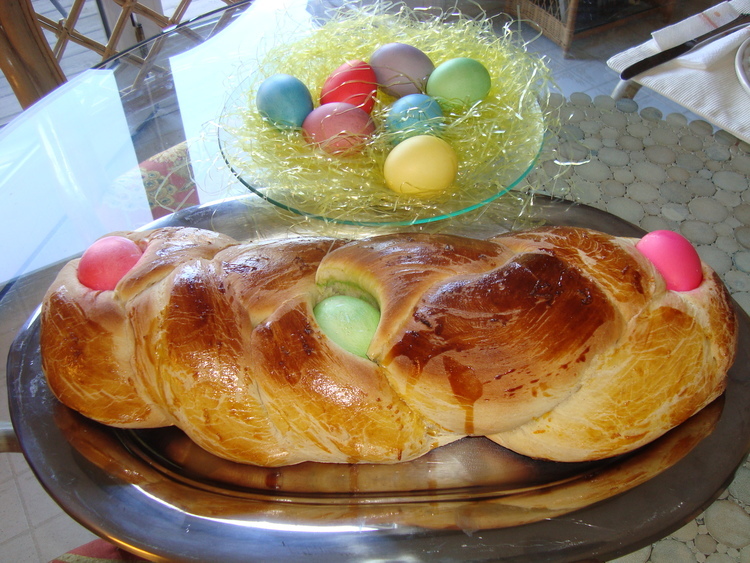 I can’t forget the Greek Easter Bread. Here is a picture from last year’s Greek Easter Bread. 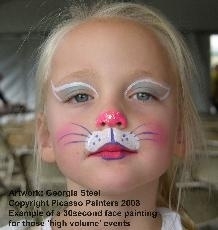 I plan to paint my grandson and granddaughter’s face like a bunny and hide some eggs outside if the Michigan weather permits. OKAY THIS IS A CAT BUT I’M GOING TO MAKE GRANDSON INTO A BUNNY FACE. 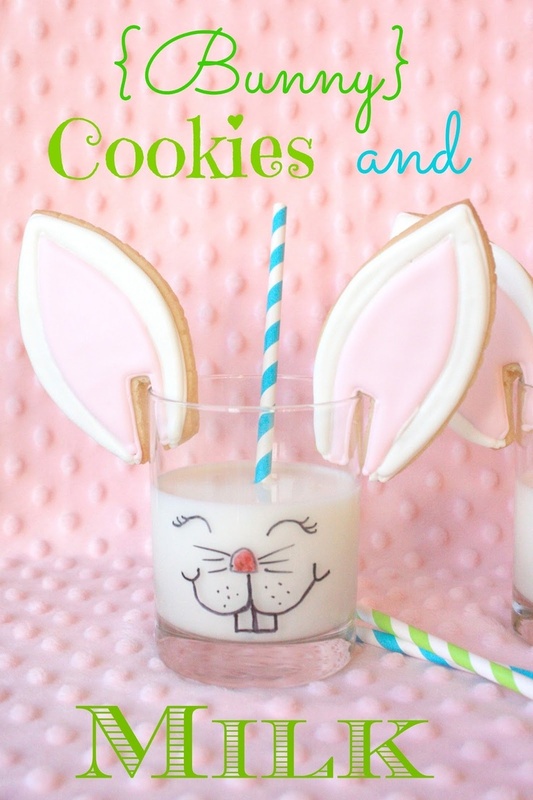 I THINK THE KIDS WILL ENJOY THESE BUNNY EAR COOKIES AND MILK! FUN! THANKS TO MUNCHKIN MUNCHIES FOR THE IDEA. 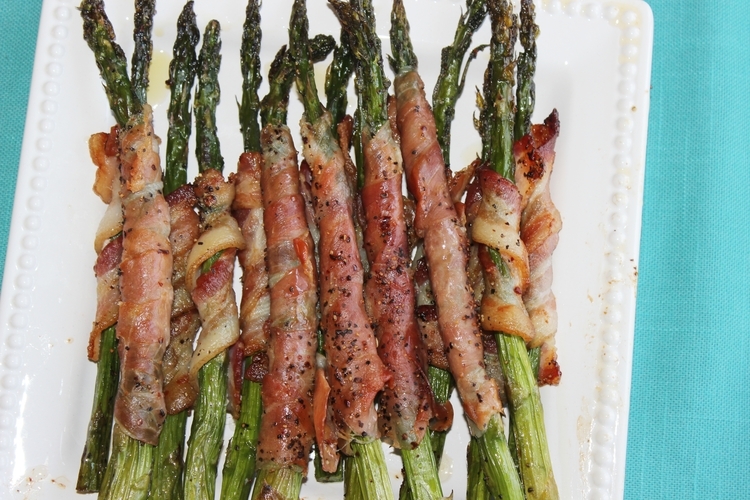 Recipe for Prosciutto and Bacon Wrapped Asparagus. This recipe very complement. specially Greek EASTER bread very interesting for dinner. I really like easter bread. it's delicious.Thanks you so much for sharing. Thanks for your comments Rony. I love the slight sweetness of Greek Easter Bread! OMG! Great recipes for easter'party! 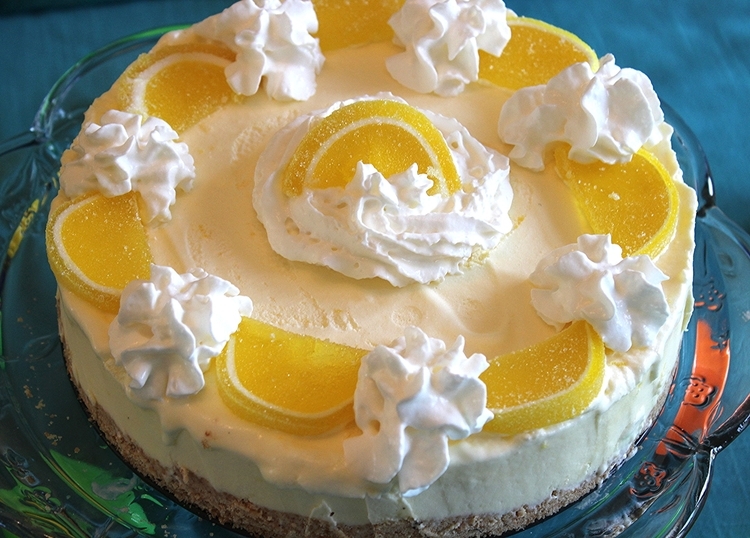 You'can't imagine the happy face of my children when I bring the lemon mousse cake and put it on the table. Thank and keep up the good work , Linda! Hi Arabella. I appreciate your comments. Thank you so much!